Iraq appears to have joined the small but growing group of countries operating armed unmanned aerial vehicles (UAVs) - or drones. Video released by Iraq's military shows a fully armed Chinese-supplied CH-4 drone being inspected on the tarmac. Poor-quality photos suggesting that the Chinese UAV may have been sold to Iraq first emerged in March. If operational, this adds a significant new capability to the arsenal of Iraq, whose air force is being rebuilt. The CH-4 can be used both for intelligence gathering and strike missions. The latest video shows the UAV armed with what looks like a Chinese AR-1 laser-guided missile specifically designed to be used from drones. The sale to Iraq underscores Baghdad's growing desire to diversify its sources of weaponry, reducing its reliance upon the US. Over the past year it has received weapons systems from Russia, Iran and China. Joseph Dempsey, a research analyst at the International Institute for Strategic Studies in London, says this is "yet another example of China's willingness to export armed-UAVs". Earlier this year Nigeria received a number of armed CH-3 UAVs from Beijing, which it appears to be using in its campaign against Boko Haram militants. "China," he says, "also seems to have pursued some kind of technology transfer with Pakistan whose own UAV programme is very much influenced by the Chinese." Pakistan's armed Burraq drone unveiled in November 2013 bears a striking similarity to the Chinese CH-3. The proliferation of armed drones worries many arms-control and human rights experts. 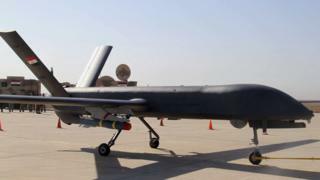 Initially the preserve of a small number of Western nations, notably Israel and the US, drone use is spreading rapidly. While extensively used in conventional air campaigns, armed drones have also become very much the weapon of choice for targeted killings in counter-terrorist operations. The ability of the armed drone to strike at individuals with little concern about crossing borders, and with little risk to the country using them, raises all sorts of strategic, diplomatic and human rights questions.